I love doing recycled crafts for kids. I especially love crafts that encourage them to be creative and can be used in pretend play. If you have a toddler or preschooler that loves rockets, than this craft is perfect for you. 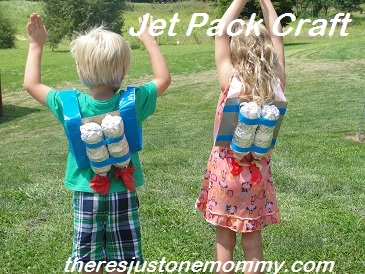 Get ready to blast off with this jet pack craft! This kids craft involves recycled soda pop bottles. Cut your piece of cardboard into a square that is a bit wider than the 2 soda pop bottles laying side by side. The piece of cardboard will serve as a base for your jet pack. 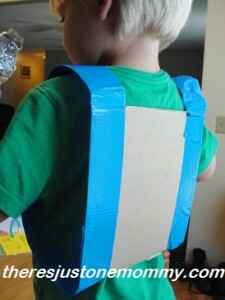 To create straps for the jet pack, measure how long they need to be and then double the length. Cut 2 pieces of duct tape this length, and then fold the tape in half, sticky sides together to form each strap. Use a bit of tape to secure the straps to the cardboard so it forms a backpack. Next, cover the plastic bottles with aluminum foil. This is a great step for little ones to help with. You could use silver paint, but aluminum foil is mess-free. Plus, most people have it on hand already, a big plus in my book. Once the bottles are covered, use strips of duct tape to hold them onto the cardboard base. Cut or rip squares of red or orange tissue paper and tape them inside the mouths of the pop bottles to form flames. Your child is ready to fly! 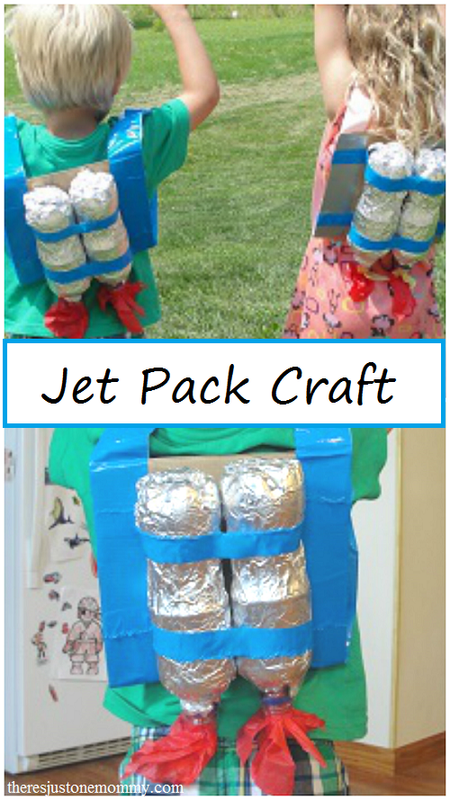 This simple jet pack craft is sure to spark hours of pretend play for your little one. OMG…that is just too cute and so much fun…I so have to do this with Dino…one day. Definitely give it a go! I bet he’d love it! I am so not crafty, but this even I could do! And he’s love it. Great project. Stopping by from SITS. This was really super simple, and they have had lots of fun with it! Thanks for stopping by! Off to read your latest! Thank you — I loved your American Girl doll school clothes! Cutest idea ever! My girls are going to love it I’m sure! Featuring you at this weekend’s party! Thanks for linkin up with me at Sunday FUNday! I appreciate you! Oh, how adorable and fun!! Thank you for sharing on Sharing Saturday!! 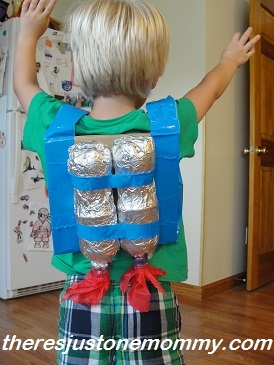 I LOVE this jet pack activity!! This would be so much fun for kids who are into aerospace or superheroes. Ok, really, what kiddo wouldn’t enjoy this?? 🙂 I’m featuring this tomorrow on Share It Saturday!